Instagram stories don’t need to be complicated to be effective. In fact, many of the best stories are little more than a set of images arranged to be aesthetically cohesive or thematically progressive. That’s why it’s fairly easy to use templates to create your stories. You still need your images or video clips, you still need your copy text and call to action, but you can leave the design and layout to professionals. Here are 30 options you can play with to find the right aesthetic for your stories. Many of them come from a couple of major services, but I tried to include a handful of other options if you don’t want to pay for template packs or if you’re looking for inspiration more than actual template files. 1. Sneak Peek – This template creates a story that teases a new product launch, with a call to action to get users to tap to see your stunning new reveal. You can customize it with imagery fitting your product and brand, as well as changing colors to fit your product. 2. Testimonial – Everyone likes a good review. When you get an influencer to review your brand, you can take their testimonial and put it to good use. Social proof on your website is one thing, but a good Instagram story can feature their review in a way that encourages your followers to check them out. 3. New Post – This is a simple template that announces a new blog post you’ve written for your website. A photo that features the core of the post, along with a title and a link, helps send people from your Instagram feed to your website. 4. Top List – This is a solid template for a top list that you can customize with specific images. By default the template comes with five pages, but you can cut it down or expand it to suit the needs of your list. 5. Favorites – Not quite a top list, this is a template for user engagement. You pick some categories and ask your users to fill them out and post their own versions. Later, you can follow up with your own, to share your tastes and engage with your audience again. 6. Hashtag – This template calls attention to a specific hashtag, along with a call to action for why your users should use it. Want to feature user content or enter users into a contest? Run it via hashtag and get them to use it with this story. 7. Days – This is a template for an “advent calendar” style day-by-day story update. Add a new page to the story each day, or publish a new version of the story with that day’s update. 8. Unboxing – A template designed to promote a video of something stylish that you upload to IGTV. You can customize it to be a call to action for a YouTube or Facebook video instead if you prefer. 9. Tour – This is a template aimed at showing a behind the scenes look at your office or studio. You can, of course, adapt it to fit whatever kind of content you wanted to share. It’s a fairly basic but stylish template you can adapt for any purpose. 10. Takeover – Instagram Takeovers are agreements between you and an influencer. The influencer takes over your profile for anywhere from a few hours to a few days, running it in their style but with your content. They bring their audience to check you out, and you expose your audience to their content. This story serves as an announcement of an impending takeover. This second section is templates from Creative Market. Creative Market is a marketplace for templates, graphics, photos, themes, fonts, and other creative assets. Graphic designers love it to gather resources to make their content, but those of you who want something a little more fully produced can dig through their templates section. 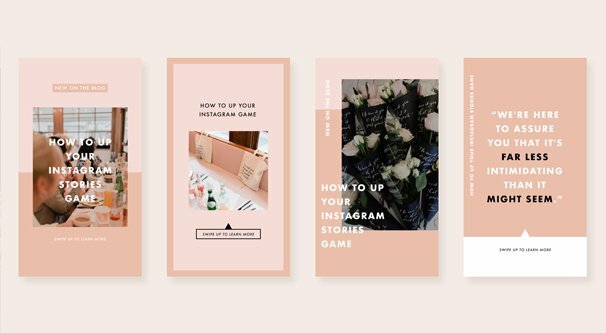 They have over 2,000 Instagram Story templates and template packs available. They cost money individually, though, so be prepared to buy what you want to use. 11. Pande’s Stories Pack – This pack contains 10 variations on a common minimalist theme for stories. They are most suitable for a fashion brand, but can be adapted for use with just about anything. The pack costs $10 for a standard license. 12. Paper Stories – This pack, by Sparrow & Snow, is an elegant set of stories and story elements that evoke the imagery of stacked, folded, and torn paper elements. It’s a clever way to use collages in an atmospheric design. A license costs $28. 13. Modern Animated – This template pack from SilverStag costs you $19 and includes 30 different Photoshop files and 100 hand-drawn items for a calligraphic effect. The hand-written items are not fonts, so they are not editable, but there’s enough variety to fit just about any brand’s needs. 14. NEORD – Produced by Invasi Studio, this pack of stories is extremely bold in a retro style. Bright and sometimes clashing colors stand out from the usual muted fare you see in branded stories. The pack has a license fee of $20 and includes 30 color and 30 black and white versions of story designs. 15. Animated Stories – This one doesn’t have a clever name, just a description. It includes a selection of story templates from Ruby&Heart Studio and costs $45 for the pack. It’s expensive because it’s a comprehensive pack of templates from the studio, each of which can be purchased individually instead. They’re often very bold and elegant designs. 16. Nomad – Animated story templates from Nomad Visuals. This is a minimalist set of 25 different animated stories, which are easy to adapt to your own branding for just about any business. The license costs $24. 17. Stories Agenda – A set of stories from EZALOR. This is an $18 pack and includes 25 different designs, many of which are inspired by urban graffiti or paint-stroke style cutouts. This is unusual for a template pack because it’s Canva files instead of the usual Photoshop files. 18. Stories Icons – This is a pack of icons specifically for use in stories. They’re icons that evoke specific kinds of events or niches, such as beauty, fashion, and travel. They aren’t full story templates, just icons you can use in your other stories. As such, the license is only $9. 19. Colorful Stories – A Story template pack by NordWood. These are bright and vibrant stories with colorful pastels, similar to the very bright stories above, but more subdued. They still stand out from the usual filters on Instagram, and can be very nice if your brand suits their look. The license is $17. 20. Onyx – These story templates flip the usual color scheme on its head to provide very dark and rich templates. There are 20 stories included in this pack from Tugcu Design, including organized layers and a multilingual font. You need to add your own photos, of course. The license is $20 for the full pack. Envato is a marketplace made up of several different marketplaces, each centering around a type of asset. Theme Forest contains WordPress themes and website templates. Video Hive contains templates for videos. Audio Jungle contains sample audio sound files and music you can license to use. They have a lot of Instagram templates, but they can be tricky to find, so here are five to get you started. 21. EasyEdit Stories – These are video templates that work with Adobe AfterEffects. There’s a huge variety of them here; you get 250 different stories and 80 elements for the meager cost of $39. This pack can last you quite a while, and the creator updates it regularly. 22. GrussGott Stories – This is another AfterEffects pack of stories, with 86 pre-made stories, 70 transitions, a pile of presets and a whole lot more. The pack is $39 and gets you a ton of content to last you throughout the year. 23. Snowcake Stories – This is a third selection of AfterEffects story templates, which are easily editable. 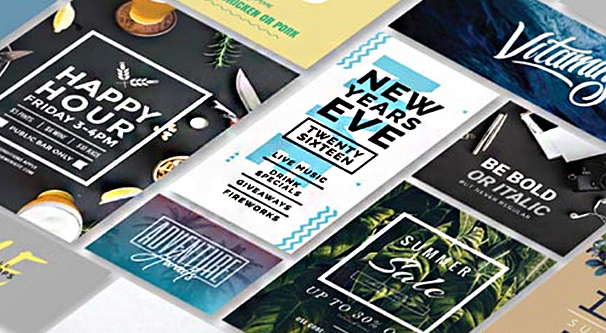 This pack comes with 40+ templates and a library of images you can use in your templates. It also doesn’t require any additional plugins to work. It only costs $15, too. 24. WebDonut Stories – This selection of stories does not include animated elements, and is thus hosted on Envato Elements instead of Video Hive. 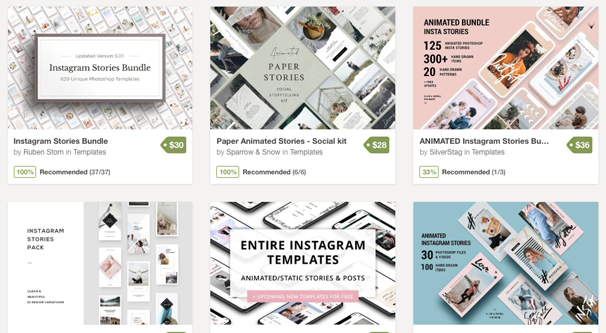 It’s a series of PDF and PSD files that include templates for stories themed around eCommerce. If you’re running a store and want to feature products or sales, this is a good, if basic, pack of templates. 25. Flikmotion Stories – A final pack of Envato stories for this post, you can find many more by browsing both Envato Elements and Video Hive as mentioned above. This is a very simple pack with only 12 story templates you can check out. The templates in this section aren’t all from any one source; rather, they’re coming from a variety of different tools or sources. I’ve included links to a few other blog posts with their own lists of templates as well, so you can see more than just the 30 I promised in the post title. 26. Challenge – This is a “template” from Instagram user @thesundaychapter, though it’s not her usual fare. You can’t download and edit the template, but you can use it for inspiration. The linked template is a movie challenge; the user creates a list of movies, and their followers copy the list and check any movie they have seen, to compare their progress against that of their peers. You can use the concept for basically anything. 27. Buffer Stories – We all know Buffer as one of the premier social media scheduling apps, so it stands to reason that they’ve branched out to encompass some of the other ways you can post on social media beyond just basic posts. They have an Instagram story creator, but the creator only has five available templates. You can see the five templates, as well as Buffer’s rundown of their qualities, in the linked post. 28. 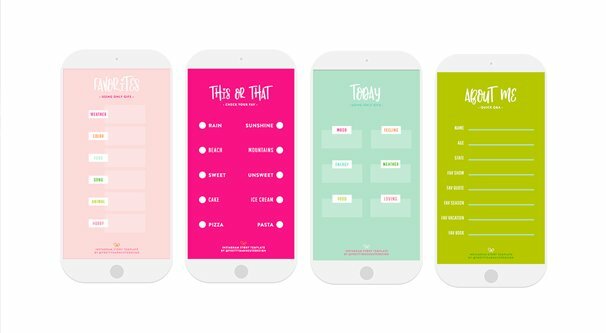 PrettyDarnCute – This is a very basic but very colorful pack of free templates you can use for your feed. They’re usually list/profile style templates for simple but effective audience engagement. Give a couple of them a shot and see how they work. 29. Profile Template – This is a template of a detailed “profile” template you can use to get users to tell you more about themselves. This one is themed after Harry Potter, allowing users to tell you their house, their Patronus, their favorite subject, and so on. You can customize it for whatever subject you prefer. 30. Later – Later is one of the foremost authorities on Instagram marketing, and this post is full of inspiration for Instagram stories. They’re “templates” in that you can copy them and adapt them to your own use, but they’re mostly just a list of examples of good stories that have been put to use by other accounts. Remember: mimic the idea, don’t steal the content. So there you have it! 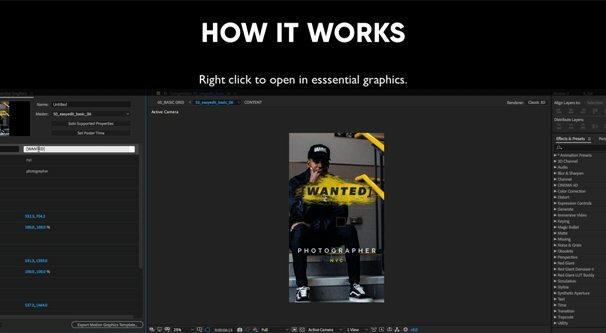 30 resources and methods to beautify your Instagram stories. Did we miss any? What is your favorite? Let us know in the comments below!